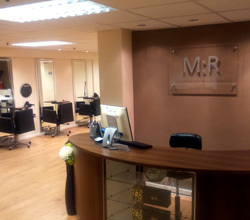 At Mark Robert hairdresssing we are proud to offer many years of experience, (see our ABOUT US page) together with an established reputation for being a high quality, yet affordable town centre hair and beauty salon. Our new ground floor premises in the heart of the bustling town centre are perfectly positioned to enjoy everything Chesterfield has to offer. There are several car parks within walking distance, and also a great choice of coffee shops and cafes on our doorstep. Free consultations are available for any salon service, so visit our SALON INFO page today, we would love to hear from you! GHD is now back in stock here at Mark Robert Hairdressing! Travel gift set including, hairdryer and straighteners. GHD V Gold Professional stylers large. Including FREE split end therapy treatment. Please call the salon on 01246 230973 for prices.